Published by: Don & Co., HUCH! & friends, Ísöld ehf. GIPF is a strategic game for two players based on a classic concept: In turns, players introduce one piece into play until achieving four-in a-row. Players then remove their row and capture any of their opponent's pieces which extend that row. This principle of capturing pieces creates each time again completely changed situations on the board. The purpose is to form successive rows of at least four pieces, until the opponent has no piece left to bring into play. GIPF is not only the name of a game, but of a project as well. This project concerns a group of games and extra pieces that will follow step by step. Each game of the project will be playable either separately, or, by means of extra pieces, in combination with GIPF. 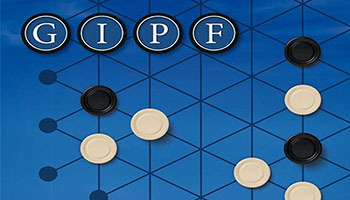 It concerns a system that makes winning or losing GIPF-related games a strategic factor of the game GIPF itself. The board shows a pattern of lines. Each line is characterized by 2 black dots and a various number of intersections with other lines. These intersections are called spots. 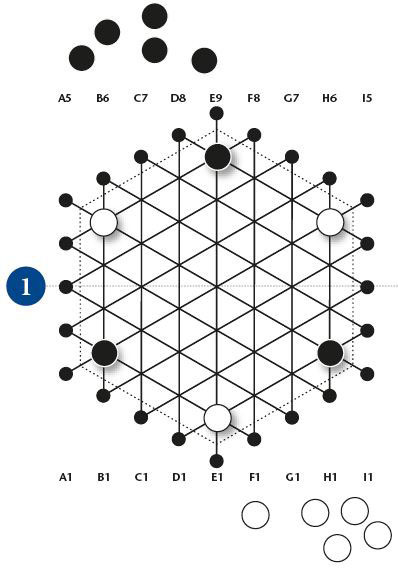 There are 24 dots at the edges of the pattern on the board. Dots are not part of the play area; they are used to position a piece before bringing it into play. When you learn how to play a new strategy game, it often happens that you feel lost in the many possibilities. Don't let this discourage you. Give yourself a fair chance and after a few games you will notice that your play improves rapidly. Below you'll find a few tips to get you started. We advise reading them after having played a first game. GIPF is a separate game and should, at first, always be seen as such. In addition, it is also the name of a project of which the game GIPF is the center. This project consists of a series of games and a number of extra pieces that are all compatible with GIPF, which allows you to combine games and to decide for yourself what, exactly, you would like to play.